Indoor localization and navigation systems are becoming more and more popular, based on their potential of quickly and efficiently guiding a user through a large building (airport, mall and similar). The basic motivation for developing such systems is that conventional outdoor navigation systems (GPS) are inefficient in closed environments. Very often, indoor navigation systems are based on the detection of WiFi-signals. This is advantageous, because most buildings are already equipped with WiFi-antennas. Additionally, a WiFi-system can identify the user though the MAC-Address of its mobile device. The biggest disadvantage of localization systems based on WiFi consists of the poor spatial resolution (usually 1-10 m). An additional problem in WiFi-based indoor localization is the loss of precision when a user is localized in a dynamic environment. Indoor environment are subjected to quick and unpredictable changes (people or objects in a corridor, closed and open doors or windows), which can dramatically modify the reflection path of the WiFi-signal and consequently the efficiency of the localization. The localization is extremely robust to changes in the environment (movable objects, variable amount of people in the building), the off-line phase does not need to be repeated frequently. The algorithm can be applied to all indoor navigation applications based on WiFi-systems. 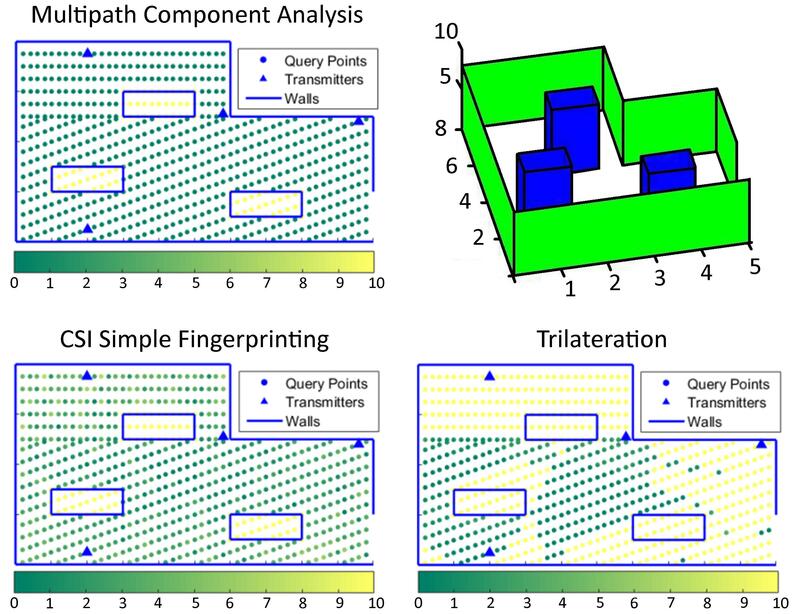 Figure: Performance of the Multipath Component Analiysis (MCA) algorithm in comparison with a simple channel state information (CSI) Fingerprinting and a Trilateration algorithm. The bar shows the localization error: When using the MCA algorithm, the localization error is 1m or less for all positions. This performance is clearly better than that obtained by the standard algorithms. In the schemes the points at which the localization measurements have been performed (query points) and the positions of the WiFi-antennas (transmitters) are indicated.Reference data are generated in the off-line phase in the absence of the obstacles. The obstacles have been including during the generation of the query points in the on-line phase. In top right panel the environment used for this simulation is shown in 3D. All distances are in meters. Images adapted from (1). (1) 2017 International Conference on Indoor Positioning and Indoor Localization (IPIN), Semptermber 2017.